The federal and New Brunswick governments have signed an agreement that will see a combined $71 million invested in early learning and child-care services for preschool-aged children in the province over the next three years. 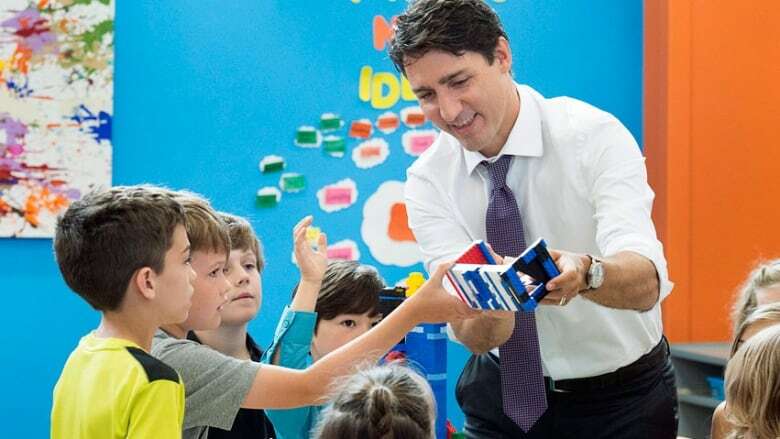 Prime Minister Justin Trudeau and Premier Brian Gallant made the announcement at the Wee College child-care centre in Moncton on Wednesday. The money will improve "quality, accessibility and affordability of service," said Trudeau. It will give children in the province a "head start in life and the tools they need for future success," he said. Under the bilateral agreement, 300 current child-care centres will be turned into designated early learning centres, which will provide more quality spaces, have lower fee structures, and implement inclusion policies and guidelines for francophone minority communities, according to the governments. A total of 200 new infant and toddler spaces will also be created and fees will be lowered for families in need. Prime Minister Justin Trudeau and N.B. Premier Brian Gallant made the funding announcement in Moncton on Wednesday. (CBC)The federal government is contributing nearly $30 million to the initiative, while the province's share is $41 million. "Education and early childhood learning are some of the best investments we can make for the future prosperity of our economy," said Gallant. "Providing more affordable, accessible and high-quality child care will strengthen families, the middle class and the New Brunswick workforce of tomorrow." Meoldy Munro, the founder and CEO of Wee College, said it's welcome news. "I think it's a validation," she told reporters. "I think that it's showing that the industry is respected, it's cared about, it's valued, and that working families in the province of New Brunswick — it makes economic sense to invest in childcare and early learning." 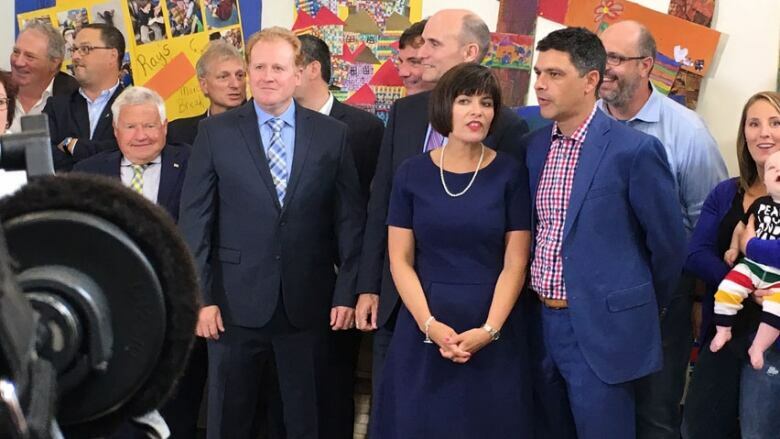 Moncton-Riverview-Dieppe MP Ginette Petitpas Taylor, who was appointed the new federal health minister earlier this week, attended Wednesday's announcement. (Kate Letterick/CBC)Moncton-Riverview-Dieppe MP Ginette Petitpas Taylor, who was appointed the new federal health minister earlier this week, attended the announcement, along with several other Liberal MPs and MLAs. The announcement comes one day after the federal and P.E.I. governments announced Ottawa will invest $10.5 million in the Island's early childhood education system over the next three years. The federal government has committed to spending $7.5 billion over the next 11 years to create more child-care spaces in Canada. Several people gathered outside the Wee College to catch a glimpse of Prime Minister Justin Trudeau. 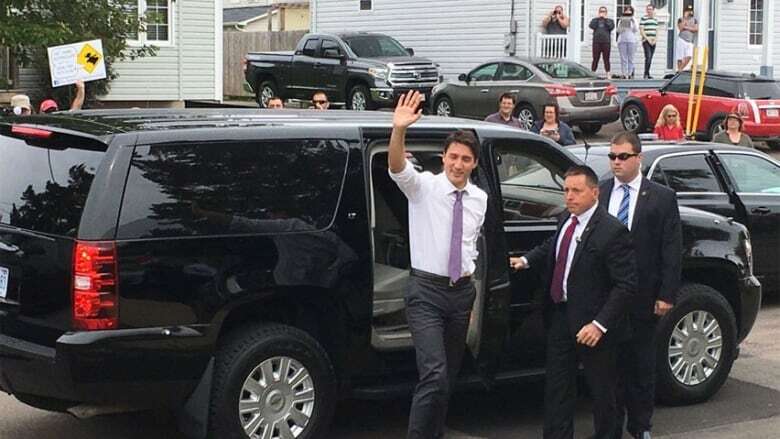 (Kate Letterick/CBC)Trudeau stopped in Miramichi later in the day to visit employees at a controversial payroll centre, but that stop was closed to the media. The office has been at the centre of the troubled Phoenix pay system, which has a backlog of 237,000 complaints from federal public servants who have been overpaid, underpaid or not paid at all. Trudeau was greeted outside the building by about three dozen protesters regarding an unrelated contract dispute. The federal correctional officers said they've been without a contract for 39 months and want better conditions. The prime minister did not speak to reporters on his way into the payroll centre. Earlier in the day, he said of Phoenix that it's "unacceptable" people are working hard and not getting paid what they're owed, and blamed the problems on the previous government. 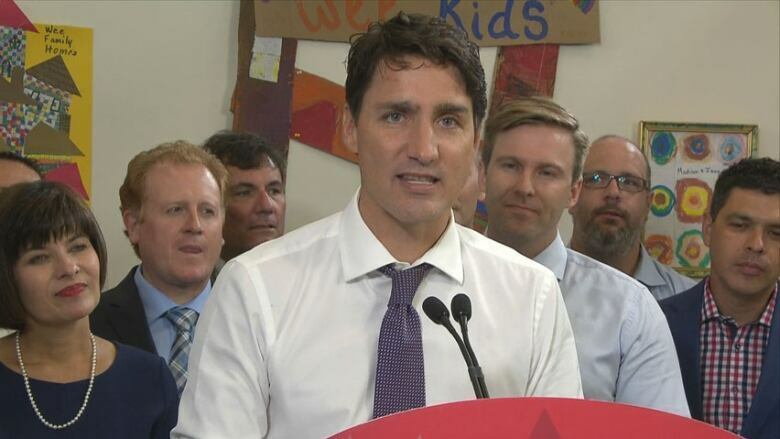 "We are working extremely hard to fix it, and when I get to Miramichi later today, I will be thanking the folks in Miramichi for having worked so incredibly hard to advance the resolution of this difficult issue," Trudeau told reporters at the child-care announcement. "People are working with a tremendous level of creativity and excellence to get ahead of this problem," he said, singling out the public service unions as "essential partners." "There's still a lot more work to do, but I am extremely grateful for the incredible work being done by the excellent folks at Miramichi." 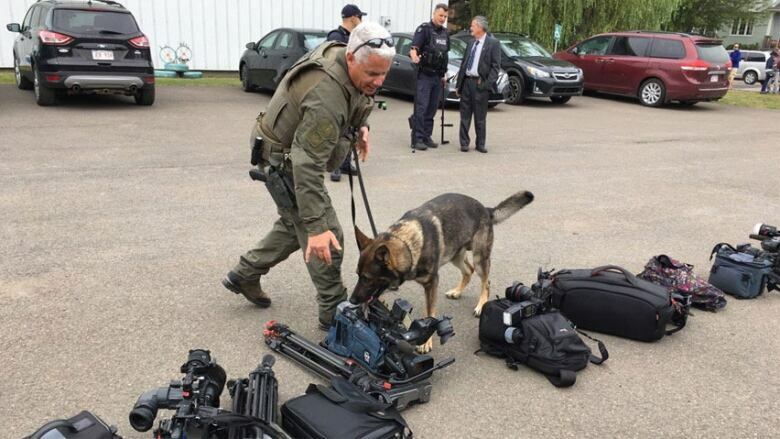 Security was tight for the prime minister's visit to the Moncton day-care centre on Wednesday, with police dogs checking out media equipment beforehand. (Kate Letterick/CBC)The centre oversees the pay of two-thirds of public servants, or about 210,000 people. It processes paycheques for 46 federal departments or agencies, including Parks Canada, Veterans Affairs and Correctional Services Canada. On Aug. 24, Greg McGillis, executive vice-president of the Public Service Alliance of Canada (PSAC), said it was a "mistake" to move the centre to the small New Brunswick city, prompting Mayor Adam Lordon to demand a retraction and apology. 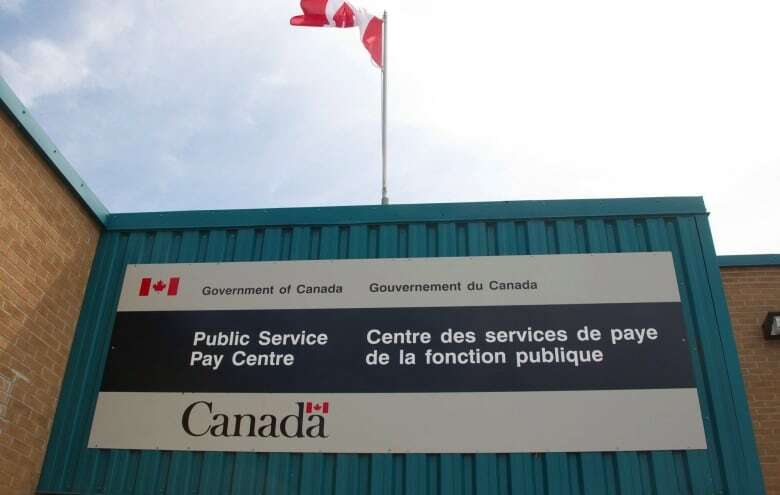 Then on Monday, Treasury Board documents obtained by Radio-Canada showed public service employees are three times more likely to see delays receiving their pay if it's processed through the pay centre in Miramichi than at federal offices or institutions elsewhere in the country.